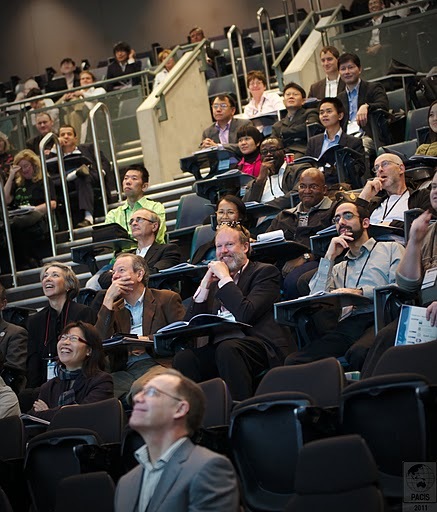 The 15th PACIS is currently held in Brisbane from July 8th until July 11th. PACIS is the foremost regional IS conference in Region 3 of the Association for Information Systems (AIS).In his keynote presentation, Prof. Dr. Kwok-Kee Wei outlined that the role of the Asian Pacific region as part of the overall IS discipline has greatly improved in the recent years. Some data to verify this observation comprise an increasing number of editors and senior editors from Asia and Pacific in the basket of IS top journals. Additional data documents that Asian and Pacific researchers are cited more than ever before resulting in higher ranks of the top Asian and Pacific research institutions also. While recent research papers stemming from this region have rather focused on emulating US-based and European-based IS research with data gathered in the Asian-Pacific region, one crucial prospect would be to focus more on developing theory that applies in Asia in particular. This claim was illustrated with usage patterns of the world-wide web which are quite different in China when compared to any western country, due to different user bases or patterns of use. Therefore, conventional theory imported from other countries might be subject to severe limitations that might need to be compensated for by making adaptations or developing new theory in local IS research departments. According to Prof. Wei, IS research in region 3 is still situated on a limited level, however is making great progress. With the future rise of the region’s overall economic impact on the world, we expect this position to skyrocket in the next years and decades. In 2012, the 16th PACIS is going to be held in Ho Chin Minh City (Vietnam), and will most likely be following up on this discussion. For more pictures on the current PACIS conference, click here.